The endless rain has started in Vancouver, and while I do love cozy days listening to the pitter-patter, walking to and from the bus stop is somewhat soggier than usual with wet autumn leaves still lining the streets. 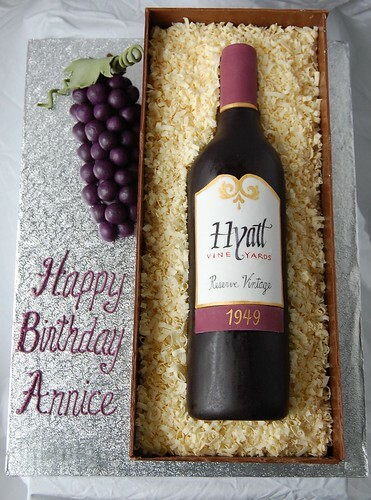 I tend to hibernate during the cold months but when asked to create a wine bottle themed birthday cake this week, the artistic challenge was quite invigorating! I had a bit of déjà vu because this cake was for another 60 year old who lives far away, just like the Tree cake. 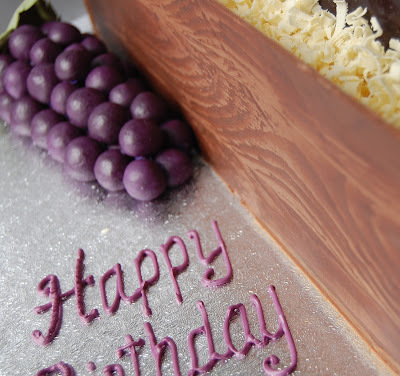 In order to make life easier, the more elements which I can create ahead of time, the better and so, the fondant grapes, gumpaste wine label and bottle cap, white chocolate scrolls, and faux-wood chocolate box panels were all done in advance. The most rewarding but time-consuming element was undoubtedly, the wine label. Having recently attended a Compressed Italics calligraphy workshop by Martin Jackson (who I secretly wish I could be), I was eager to practice this hand and experiment with my calligraphic tools on dried gumpaste. Using Wilton colour paste mixed with vodka for ink, my Speedball C2 nib flowed quite nicely whereas the pointed nib was more tricky since it tended to scrape into the gumpaste and get clogged. The cake itself was built from a 10 x 15 x 3 inch slab of chocolate cake layered with whipped dark chocolate raspberry ganache. 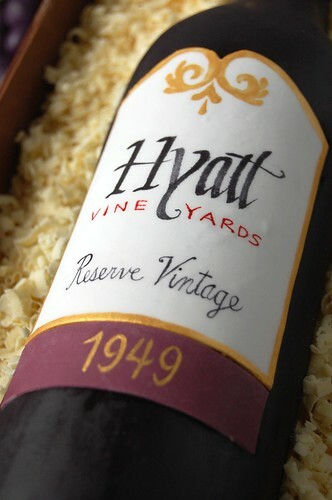 This was divided into the 6 x 15 x 3 inch box and the remaining section was carved into the life-sized wine bottle which was covered with black rolled fondant and stacked on top of the box. I never think of myself as particularly skilled at doing highly realistic cakes but this was quite a lovely outcome! Posted by Charmaine at 3:11 p.m.
wow! I've been lurking and reading your blog and admiring your cakes for some time now. Your cakes are beautiful, and I can hardly believe that some of those things are even possible?! Thank you for sharing your gift (and your hard work!) with the blog-o-sphere. November 16, 2009 at 5:14 p.m.
We loved the cake! Amazing work, and sooo tasty too. November 16, 2009 at 8:04 p.m.
November 17, 2009 at 4:42 a.m.
November 17, 2009 at 5:06 a.m.
November 17, 2009 at 5:43 a.m.
i made a cake like this for my dad and does not even come close to what you have done here. great work! November 18, 2009 at 1:15 p.m.
November 18, 2009 at 8:26 p.m. I have followed your blog for quite some time, and you cakes are just amazing. But this one just took my breath away! It's not just an amazing cake, it's a piece of art! November 19, 2009 at 2:41 a.m. 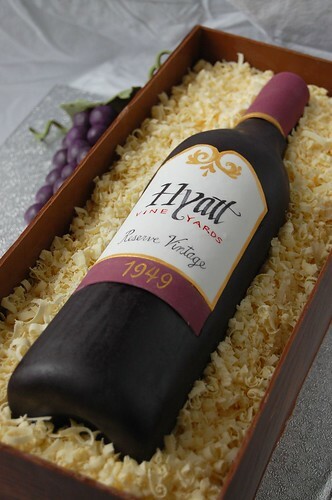 I really thought those were real wood curls and a real bottle set on top of the cake. That is so amazing. You are so talented. Bravo! November 24, 2009 at 11:01 a.m.
that wood panel for the box...that is way amazing. If u get a chance do share the technique. November 30, 2009 at 4:03 p.m. This cake is amazing!!! You say your cakes aren't that realistic, I have to disagree this is very realistic indeed. I love your calligraphy work it is wonderful. I also second B I would love to know how you got the great wood grain on the chocolate panels of the box. December 16, 2009 at 5:14 a.m.
Sugar Siren: Wood grainers are commonly found at hardware stores (typically used for faux finishes). I dragged it through dark chocolate first, then finished with milk chocolate. Hope that helps! December 16, 2009 at 9:28 a.m. Thank you so much Charmaine. December 16, 2009 at 3:13 p.m.